Among the masters including John James Audubon, Pierre-Joseph Redoute and Margaret Mee, Heeyoung's works were exhibited as the first and only living artist in this renowned natural history art gallery. Chicago, IL, 03/27 - 05/31, 2015. Below is a slide show from the exhibit. 6 paintings of orchids were exhibited among 10,000 live orchids! At Chicago Botanic Annual Orchid Show, Heeyoung's paintings greeted tens of thousands visitors at the entrance. Only ferns and plants that don't need a lot of water were displayed near my paintings to keep them safe. 3 days of orchid painting workshop was accompanied to this orchid show and exhibit. 2017. Her first solo exhibit at Brushwood Center brought her a reputation as a wildflower painter. Her inspirations shown in this photo are leading conservationist Stephen Packard and Linda Master, and her teacher Derek Norman, who opened the door toward the world of botanical art to her. 2011. Plants of the American Prairie. 8 watercolor paintings of prairie plants. Plants for the exhibit were carefully selected for harmonious display with blue, pink and yellow flowers. Dragging the big paintings from Chicago to London was quite a challenge, but that was a very good experience, especially when it was paid off with a gold medal. Horticultural Society of New York and the American society of botanical artists host one of the finest botanical art exhibits. Heeyoung has been in the show in 2008, 2010, 2011, 2012, 2013, 2016. She won several awards including Best in the Show, 2012.
photo: Display from the exhibit, 2016. The first from the right is Yellow Slipper Orchid by Heeyoung Kim. Hunt Institute at Carnegie Mellon University, Pittsburgh, has the largest botanical art collection in North America, and artists can get in once in a life time. Two of Heeyoung's works, a watercolor (Green Dragon) and a pen-and-ink (Prairie Dock), were exhibited in 2010. Prairie Dock (Silphium terebinthinacium), pen-and-ink by Heeyoung Kim is in the permanent collection. The American Society of Botanical Artists and NMNH collaborated a traveling juried botanical art exhibition with paintings of endangered species from around the world. The exhibit traveled 5 venues including Smithsonian museum. Royal Catchfly, Silene regia, a federally listed endangered prairie plant, by Heeyoung Kim, was chosen for the exhibit banner and invitation card at Smithsonian, 2010. This endangered prairie plant got some heat with 'Losing Paradise" exhibit. The whole exhibit was invited to Shirley Sherwood Gallery in KEW garden. As a total beginner botanical artist at that time, I was delighted to see my painting in the signboard at KEW, 2011. Margaret Flockton Award is the only juried exhibition for traditional ink botanical illustration in the world. Heeyoung uses crow quill pen and old style bottled ink instead of convenient mechanical pens, because she feels and breathes the history of this art form through the traditional medium. 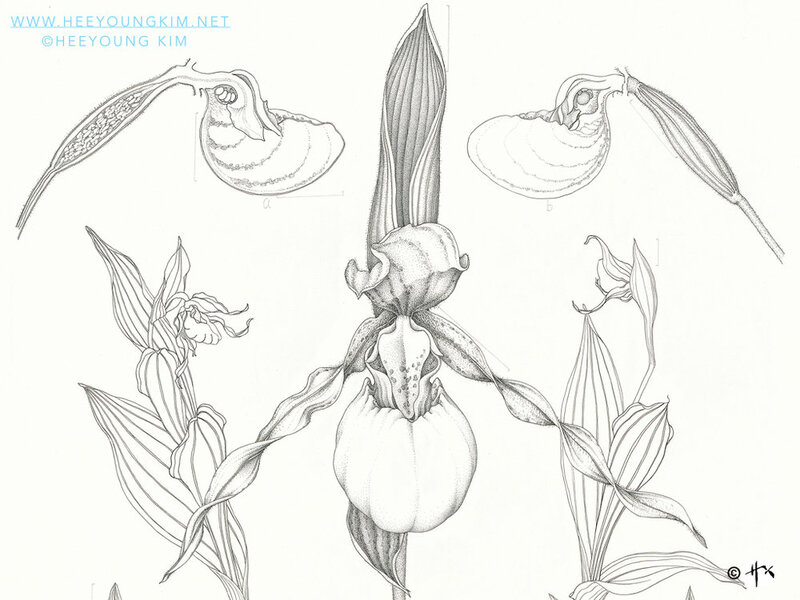 She exhibited her drawings of White Lady's Slipper in 2010 and Green Dragon in 2013. From the results of joyful learning in Heeyoung's workshops and classes at Brushwood Center, annual exhibition is mounted at the end of the year. We are proud of our past two very successful exhibitions, and excited with upcoming 3rd exhibit, Nov 12 - Dec 21, 2017. Upcoming 3d Exhibit Opening Reception: Nov 12, 1 PM - 3 Pm. Meet the artists and enjoy live music and refreshments. Losing Paradise? Endangered Plants Here and Around the World: a travel group exhibition hosted by the American Society of Botanical Artists in collaboration with Smithsonian National Museum of Natural History at 5 venues.